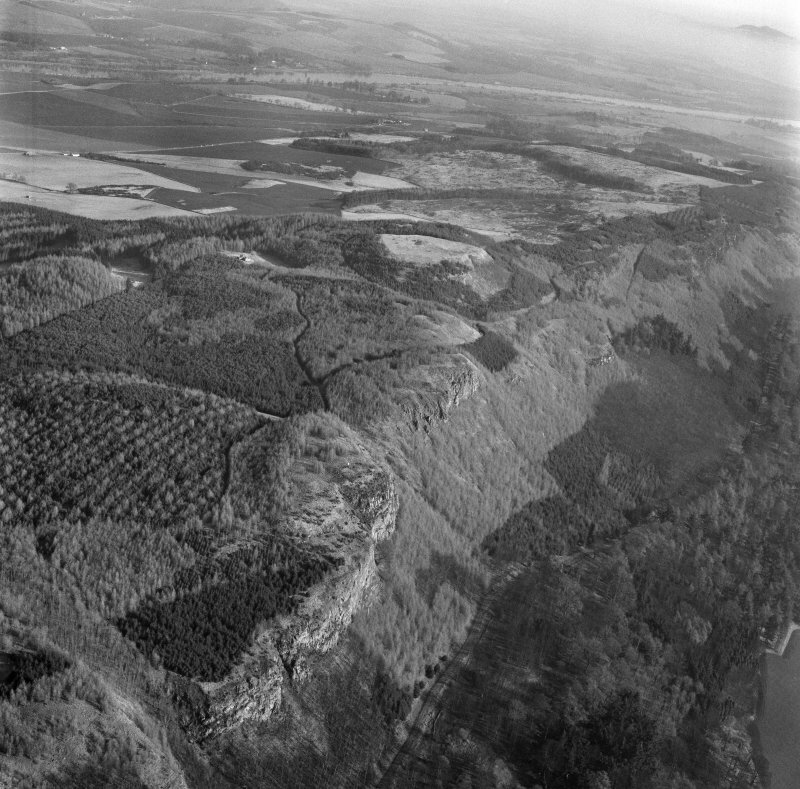 General oblique aerial view of Moncreiffe Hill and Strathearn beyond, looking W.
Oblique aerial view of the fort on Moncreiffe Hill, looking E.
General oblique aerial view of the forts on Moredun Top and Moncreiffe Hill, looking NNE. 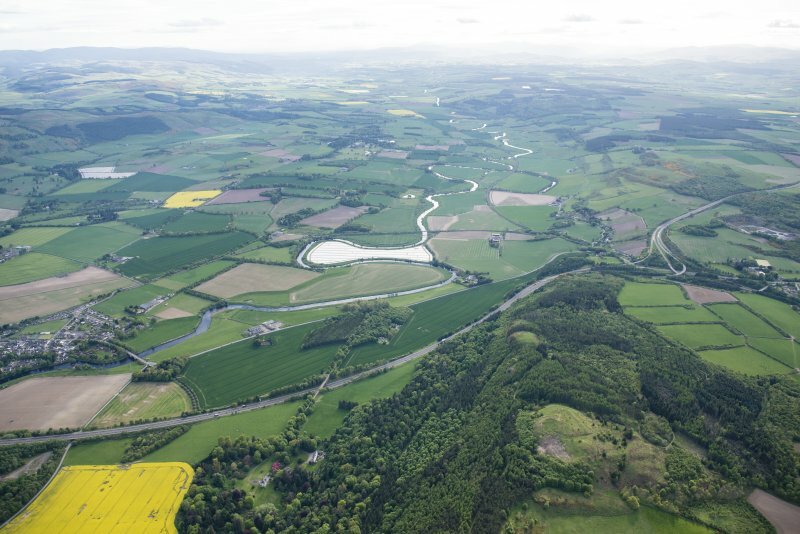 Oblique aerial view of the forts on Moredun Top and Moncreiffe Hill, looking ESE. 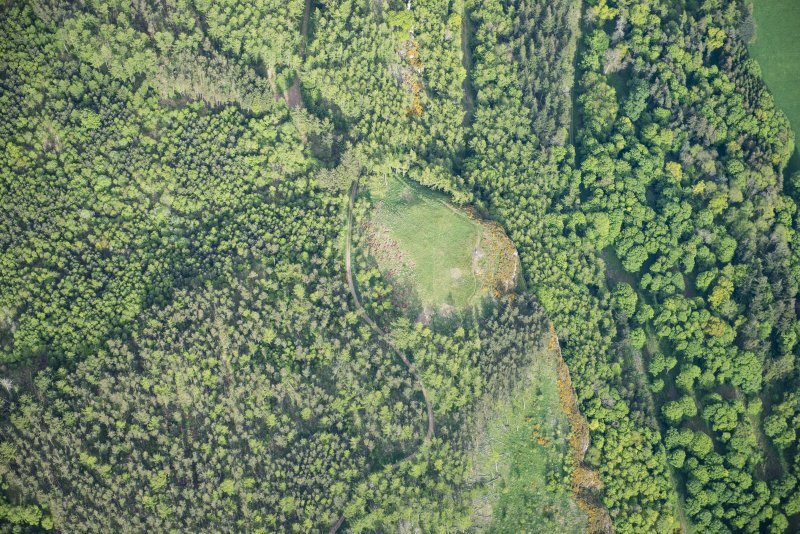 Oblique aerial view of Moncreiffe Hill fort, looking SSE. 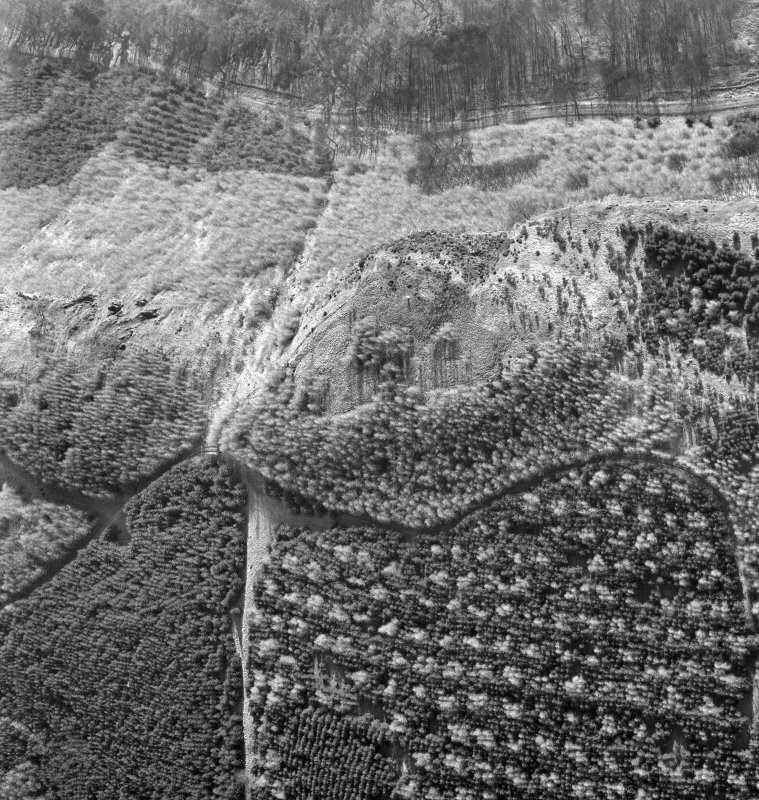 Oblique aerial view of the forts on Moncreiffe Hill and Moredun Top, looking W.
Oblique aerial view of Moncreiffe Hill fort, looking SE. Oblique aerial distant view from west. The slight remains of this fort are situated on a craggy height with a cliff on the south and steep slopes on the other sides. On the SE side are traces of a rampart 1.0m high externally and not exceeding 0.3m internally which may have continued to the NE to form an annexe, but could not be traces further due to Forestry Commission planting. On the NE are slight indications of stony construction but elsewhere only a faint suggestion of scarping marks the possible course. There is an entrance from the SE and a possible entrance from the W. Resurveyed at 1/2500. The plateau is bounded by the remains of a wall, in places a foot high, forming an irregular circle, from which the gound falls away very rapidly. There does not appear to have been a ditch. Christison could only find a mass of rough masonry in a chance break in the ground. Information from OS (DJC) 23 June 1965. Sources: Name Book 1860; D Christison 1900. All traces of previous Forestry Commission plantings have been removed from the area of this fort, but it is so poorly preserved that no further details can be added to the existing OS plan and description. Visited by RCAHMS (JRS), September 1996. 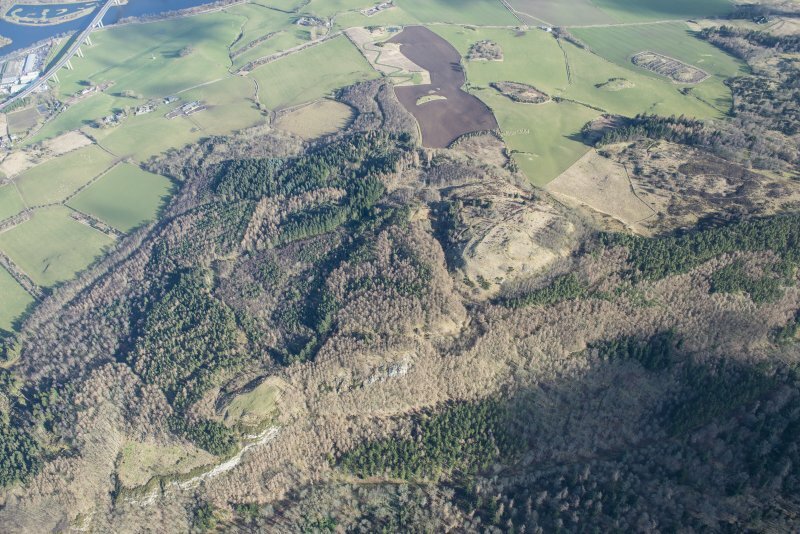 NO 1313 1988 Resistivity and magnetic surveys were carried out, 19–23 April 2013, over the central area of the hillfort. This is not a good area for magnetics as the bedrock is a lava flow which outcrops at the S edge of the fort. The grey scale display of the magnetic survey has a rather granular texture with no obvious archaeology, and it seems likely that most of the anomalies have a geological origin. The resistivity work hints at two circular features 10–15m in diameter. 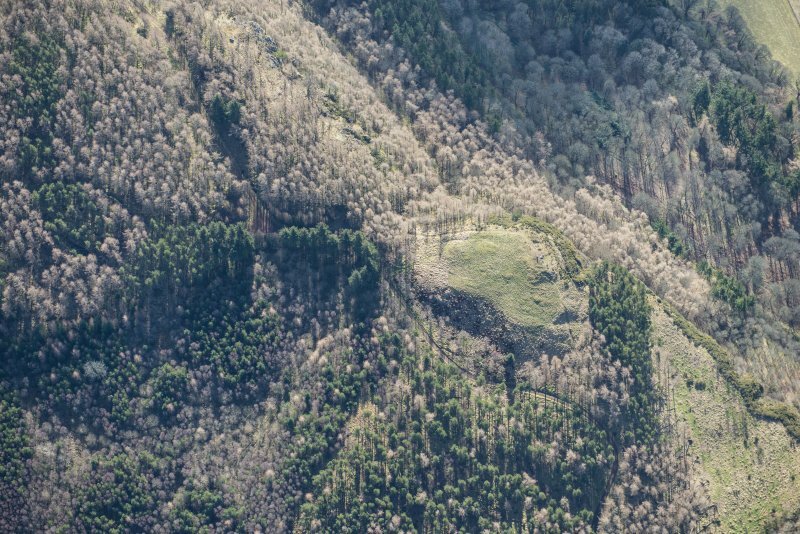 Taking a positive view, these could be enclosures or habitation features, being more negative, they are related to the forestry which formerly covered the site. 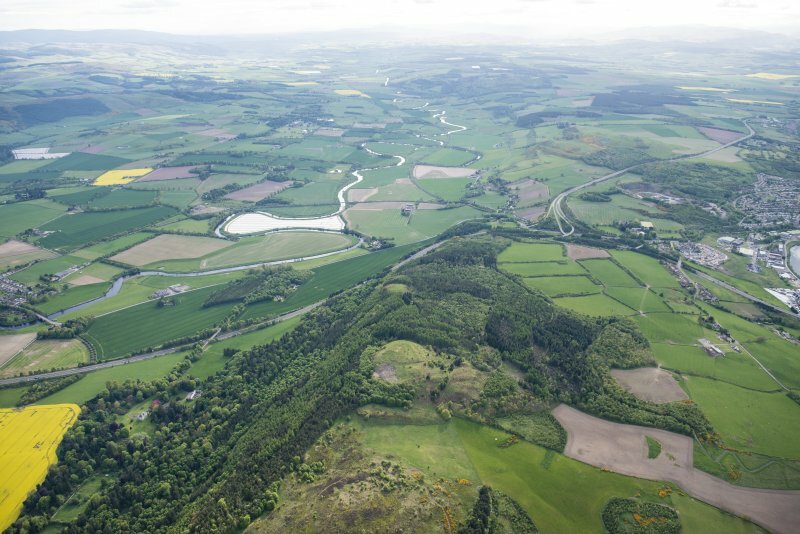 NO 1313 1988 Phase 1 of a programme of archaeological work was undertaken, 1–6 September 2014, at Moncreiffe Hillfort by Tay Landscape Partnership, led by Perth and Kinross Heritage Trust, and delivered by AOC Archaeology Group and local volunteers. 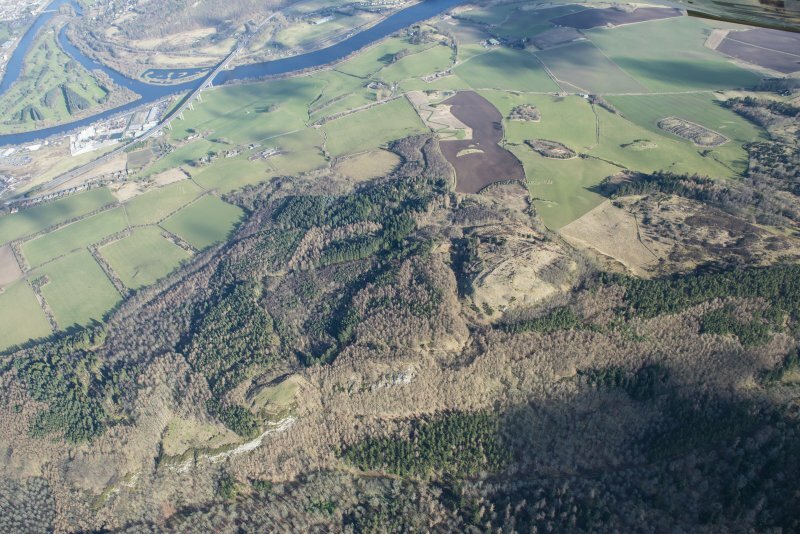 The evaluation consisted of the excavation of three trenches located over the potential ramparts of the hillfort and a laser scan survey of the monument. 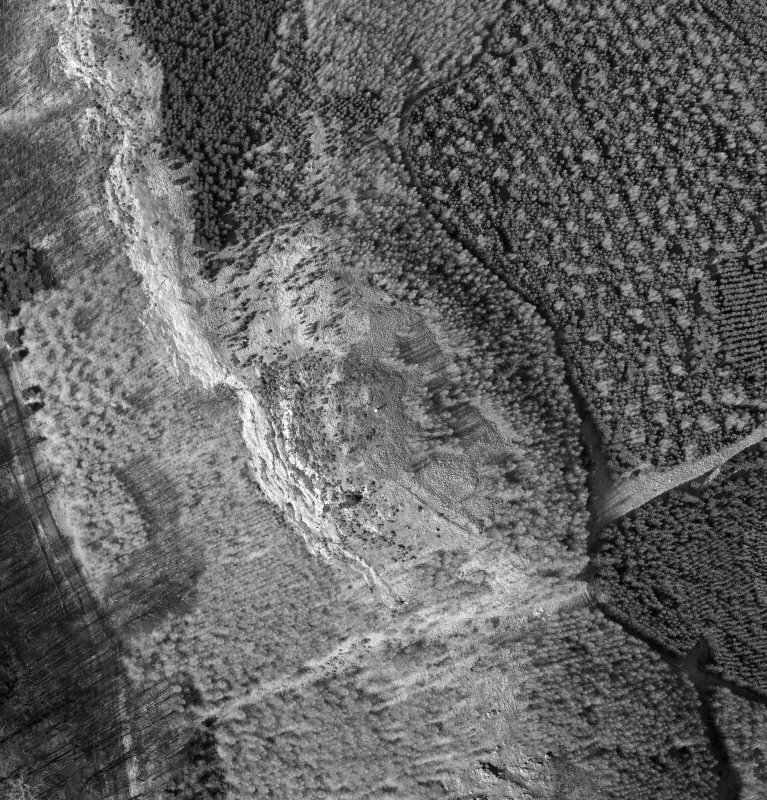 The laser scan produced a detailed topographic map of the hillfort, which demonstrated that the upstanding earthworks of the hillfort consisted of the slight remains of a single rampart along with two possible entrances, one to the E and one to the W.
The three excavation trenches provided evidence of the structure and use of the hillfort. These structural remains comprised a rampart with an earth core and dry stone facing, recorded in two of the trenches, along with a hut platform constructed on top of the slumped remains of the rampart in one trench. No rampart was identified in the third trench, but a bedrock-cut ditch was exposed that may relate to activity in the hillfort. An artefact assemblage relating to the use of the hillfort was recovered, including a fragment of a shale bracelet and a possible stone gaming piece. trenches in 2014 (DES 16, 140). 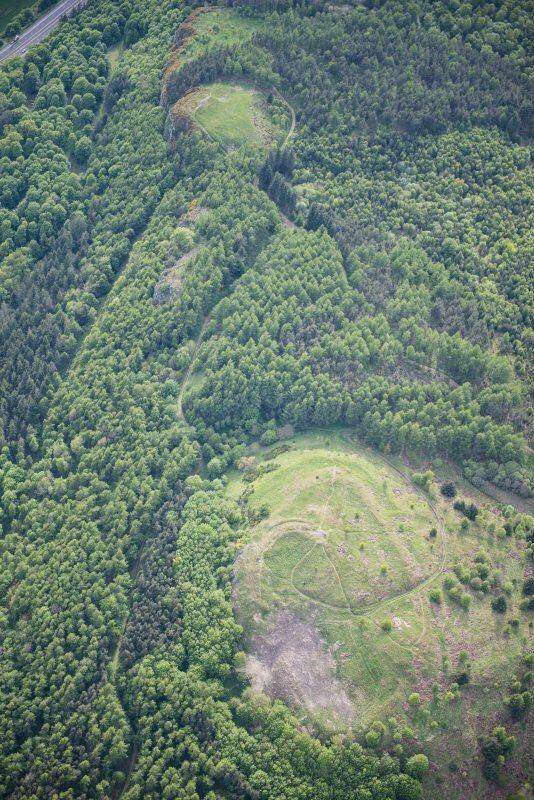 there would appear to be at least four concentric ramparts at parts of the hillfort, although it is not clear whether these are contemporary or reflect multiple phases of construction. 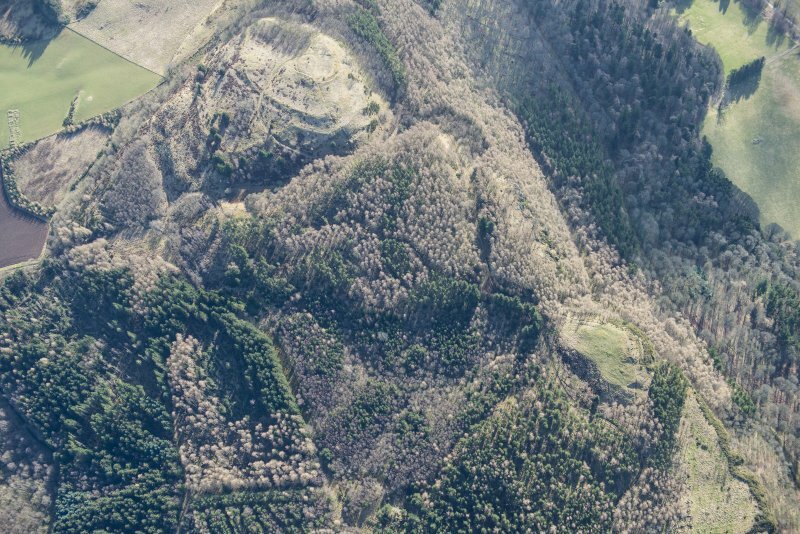 A 2 x 10.5m trench excavated over the eastern circuit of the hillfort enclosure revealed a stone-faced rampart, along with a series of cut bedrock terraces. 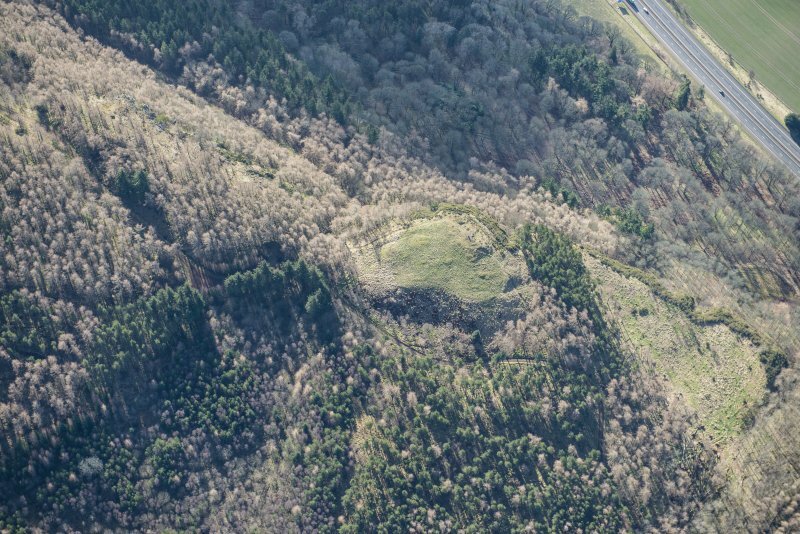 A 7 x 6m trench excavated over the entrance in the W of the hillfort revealed the entrance, which was defined by a cut bedrock terrace to the interior of the hillfort and a stone bank forming the outer edge of the entrance. A fourth trench excavated over a scoop, putatively identified as a house platform within the interior of the hillfort, revealed this feature to be of natural origin. The remains of a fort are situated on a local summit along the ridge of Moncrieffe Hill. Its defences comprise a heavily degraded rampart reduced to little more than a scarp which can be traced round the margins of the summit on the E, N and W. A line of facing stones is visible on the NW, where excavation in 2014 revealed a mass of tumbled stones on the slope below; further excavations in 2015 are being carried out to discover whether there are also outer defences lower down this slope below. A second trench through the rampart in 2014 showed that its core on the ENE was substantially of turf, while the extension of the trench down the slope in 2015 has revealed traces of what may be cut steps in the bedrock. The interior, which is featureless, is irregular on plan, measuring about 70m from ENE to WSW by 50m transversely (0.27ha), and there are entrances on the W and E. Fugitive traces of occupation were revealed by an evaluation trench in the interior, and finds to date include pottery, a fragment of shale bracelet, a few coarse stone tools and a possible gaming piece.